Holbeach United Reserves lost 9-1 to Moulton Harrox. 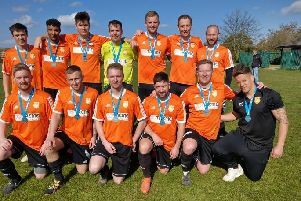 Pictured are Anthony Murphy, Jordan Clow, Scott Powley, Steven Barnes, Dan Worthington, John Smith, Josh Lawrence, Pawel Madrejewik, Joe Millinson, Tom Gosling, Calum Davis, Andy Williams, George Senior, Jack Baker, Jimmy Ward, Davey Shepherd, Dean Elston and Omah Joof. It was a bad night for the three local non-league sides in action last night (August 23). Yaxley were beaten 1-0 at Dereham in their FA Cup preliminary round replay while Whittlesey Athletic were brought back down to earth with a bump. They lost 2-1 at Raunds Town in Division One of the United Counties League three days after their record-breaking 15-0 win at Burton Park Wanderers. And in the same division Bourne Town lost 3-1 at Stewart & Lloyds. On the ChromaSport & Trophies Peterborough League front, reigning champions Moulton Harrox are back at the top of the Premier Division table. They thumped Holbeach United Reserves 9-1 last night with Marcus Parry and Martin Sandall both netting four times. Elsewhere AFC Stanground Sports won 5-1 at home to Sawtry while Pinchbeck United were 5-3 winners at Crowland thanks to goals by Oliver Maltby (2), Tony Edwards, Leo Orrey and Tom Brooks.